As we sat around reminiscing about our favorite 7-Eleven team moment, it suddenly dawned on us that no one had ever heard much about the bikes they rode. What about the hearsay regarding the team bikes being built by someone other than what the downtube sticker read? Who actually made the bikes? Did the riders actually like them? In order to get the inside story on the bikes that helped define American cycling, we chased down five people who not only had an intimate knowledge of the bikes, but a personal history with them. By the time the 7-Eleven team assembled for the pre-season training camp in January of 1989, we were one of the best teams in professional cycling. In ’86 we had won a Tour stage and worn the yellow jersey courtesy of Davis Phinney and Alex Steida. We’d won the Tour de Swiss and three Tour stages in ’87 with Andy Hampsten, Davis again and Dag Otto-Lauritzen. Of course there was Jeff Pierce’s thrilling win on the Champs Elysee. 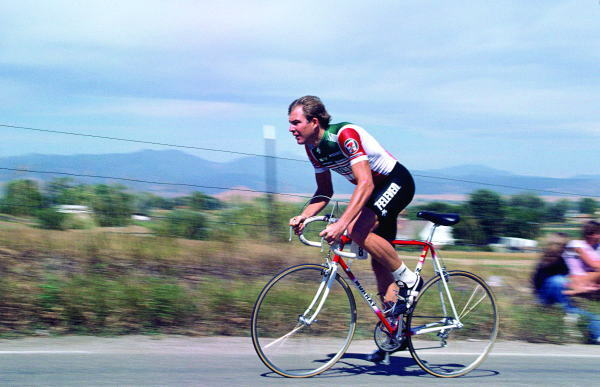 In 1988, Andy of course won the Giro d’Italia and remains the only American to do so. By the time we gathered for that camp on the California coast, we were a berserking fraternity of lunatics. For the ’89 season a few changes were implemented by the team to enhance our Euro cred, most obviously with the addition of big stars like Sean Yates and Gerhard Zadrobilek. Gerhard went on to win the Classica San Sebastian that year and Sean was an absolute beast throughout the year. As luck would have it the weather in Santa Barbara was absolutely perfect throughout our training camp and many teams would follow our lead for running their camps in the area, especially Lance Armstrong’s USPS and Disco outfits. Our future seemed so bright on those idyllic California days that we had no idea how fickle the cycling gods could be and spun our days away in bliss. Not so for the biggest star in cycling who was also in Santa Barbara. He had become the first American to win the Tour de France in 1986-his name of course was Greg LeMond. Greg had been shot while hunting in the spring of ’87 and had struggled ever since to regain his form and fitness. By that January in 1989 LeMond was getting closer to the nadir of his career. By the spring of that year Greg’s slide toward oblivion was gaining momentum with each failed comeback attempt. In the meantime our team was riding high, piling success on top of success. We were all psycho killers and we had LeMond to look up to. Incredibly, nobody could predict how the tables would turn. How it would be our team that was struggling for results while LeMond achieved one of the greatest comebacks in cycling history. Greg overcame insane odds in the final time trial of the Tour that year to wrestle the yellow jersey away from Laurent Fignon and win his second Tour by the slimmest margin in Tour history. For the 7-Eleven team, we would not be able to replicate our Tour success. I always wore my pants high and tight in those days, but that wasn’t the excuse I proposed for the team’s sparse results. Nor was our equipment in any way culpable. Starting in 1989 Eddy Merckx became our bike sponsor and he came to that training camp to size us for our bikes. Seeing Eddy in Santa Barbara was so special. He stood out wherever he went and even though no one knew who he was, they knew he was special. Not just as an athlete, but as a significant human being oozing with personality. It was like being in the presence of someone like Jim Thorpe or Muhammad Ali. Eddy espoused a more radical position on the bikes and went to great lengths to assess our positions and build frames according to his ideas. Although none of those changes were huge, a few subtle changes added up to very different machines. Eddy suggested my bike have a slightly longer top tube and a bit more relaxed seat tube angle. The bottom bracket would be a bit lower and the chainstays a bit longer. Those bikes rode a like a dream; smooth and stable and built for many miles in the saddle. We had had a number of frame failures the previous year because our tubing sponsor was trying out some hyper thin tubesets that had a disconcerting tendency to split apart wherever there was a brazed-on attachment. After I had broken no less than three frames by May the previous year, the team finally decided to have the bikes made with a different tubing. On the component end there was never a doubt that we were riding the finest parts made. Shimano provided us with perfect parts; the shifters, brakes, hubs, cogs etc. all performed flawlessly. We also got a chance to use prototype index shifting and arguably the best pedals ever made. In fact, Tour winning Pros would continue to use those same pedals well into the new millennium. ‘I joined the team in 1982; I think I had a Raleigh before joining the team. Our early team bikes were Italian Rossins with Campy Record parts. Italian frames always fit me well, as they tended to have shorter top tubes. My bikes were generally 59x57cm, 73-degree seat angle. They worked well and we won lots of races. ‘In the first year (1981) the team rode on Schwinns, then the next year we rode the Italian Rossins which were very nice bikes. Midway though 1983 we picked up Murray as a sponsor and the bikes were built by Serotta, which was what started my on-going relationship with Ben. At some point, maybe ?87, the team switched bike sponsors to Huffy, but they were still built by Serotta. Then in the final two years of the team’s existence, we had Merckx as a sponsor. In general, the bikes were all very nice, for their time. With the Serottas, it was great, as I was able to tweak the frame and we tried lots of different configurations. As an example, I loved to rail corners, and as stems became stiffer and wheel technology evolved, I asked Ben to not use lugs on the head-tube, so as to give the front end a more supple feel. Another thing we tried was using the bent chainstay to keep the chainstay longer so as to give the bike better traction in a sprint, but make it stiffer at the same time. And this became an industry standard for years to come. I loved to mix and match tubing; trying for example a heavier downtube/seat tube, with a lighter top tube. In the Murray days, initially we used Columbus tubing, but then we switched to True Temper and we had all sorts of problems defining the right tubing makeup for optimal ride quality. I remember riding in the Tour of the Mediterranean in ?86 and feeling like I was gonna get thrown off my bike by every bump in the road-the bikes were way too stiff and unforgiving. But Ben quickly dialed them in and we had some great frames, especially in ?88, when I won the Coors Classic. The Merckx bikes were all round workhorses, Eddy made guys like Hampsten the super-light (relative terms compared to now!) frames, but those were way too whippy for me, so I stayed with heavier tubing. ‘I got started building frames when I was working in a bike shop back in 1972 when I was just 14 years old. The team had its roots in the Wolverine Schwinn team, which Jim Ochowicz used to run. We had been building bikes for a number of the top amateur riders in the early ’80s and then we built the technical support bikes for Campagnolo. In advance of the ’84 Olympics, Murray signed up to be the bike sponsor for the U.S. Olympic team and they didn’t have a clue what real bike racers used. They had to cough up extra money to get real bikes made and Bill Woodull from Campy tipped us to Jim. I have to say it was a huge honor to make the team frames. The Murray bikes that we built from 1984-’85 used Columbus tubing and for the most part they reflected the fashion of the times; stiff, steep and high off the ground for short distance crit racing. I remember that for the first year or two we built the bikes as requested by the mechanics; the riders weren’t involved in the process. Davis and Ron stood out at the time as the two riders who were most interested in their bikes and provided the most useful feedback. The real excitement began when the team turned pro and headed to Europe for the Tour. The bikes changed and became longer with more relaxed geometry, usually laid back by an extra half to one degree. About this time the riders had started to form solid relationships with the European riders and they wanted to fit in, so they started making changes suggested by the Euros. They invited us to make the bikes as exceptional as we could, and one thing we did was bend the chainstays, which was something we had started doing with the Olympic track bikes to provide more heel clearance. The accidental discovery was that the riders said it made the bike stiffer and ride better. Most people thought the bikes got damaged in shipping when they saw the chainstays. That was when True Temper came along. They had great enthusiasm and wanted to get in on the high-end scene and Ochowicz wanted more money for the team. Around this time we also started getting pressure to build the bikes lighter. Lighter than we wanted, actually, and we didn’t have the backbone to push back. Between the team’s prodding and True Temper’s insistence on reliability, we started using thinner wall tubes, and it didn’t work out. To this day I still remember getting the first call about a broken frame. By the end of the spring campaign we probably had ten broken frames, but it might as well have been a hundred. It was such a shock because we had never seen failures like that before. True Temper was very responsible and wanted to learn what the cause was so they could learn from it. For the Tour de France we built new frames with heavier tubing, but by the end of the season the relationship was pretty damaged. ‘Like most kids growing up back then, I started riding on a BMX bike. One day when I had a flat tire I decided to take my sister’s ten-speed Raleigh out. I loved it! I loved how fast you could go on it with the skinny wheels and gears. I worked all winter helping my dad so I could buy a Trek 560. In 1984 I watched the Olympics and got totally inspired to be a bike racer. I started actually training and doing the long distance ride with the Bombay Bicycle Club in Madison. I won a bunch of races in Wisconsin and throughout the Midwest. I finished second at the Junior Nationals in 1986, and that’s when Jim Ochowicz came calling. I got a ride on the 7-Eleven Midwest Junior team and then moved up to the amateur team. Following the ’88 Olympics, the team was pretty focused on racing in Europe. I wasn’t sure I wanted to turn Pro, but as a kid growing up I always dreamed of racing in Europe. I raced Paris-Nice and a few minor Classics, but unfortunately, I only lasted for a few months before I wanted to go home. ‘Och’ gave me the opportunity to come back over, but I passed. It was a sink or swim situation, and unfortunately, I sank. I went on to ride with Spago and Saturn, but never again had the chance to race in Europe. Getting a hold of Andy Hampsten is not an easy feat. It’s not that the only American ever to win the Giro D’Italia is a recluse, he’s just frequently without access to communication because he’s often somewhere exotic on his bike. And that’s usually in Italy where he currently runs a business running bike tours. We finally caught up with the 45 year old American cycling hero when he was back home in Boulder, Colorado for a brief visit. RBA: How did you get involved in racing? Andy: I loved to ride and play with bikes. I first raced when I was 12, and at 15 I got fairly serious about it while my family spent a summer in England. RBA: How did you get the 7-Eleven gig? Andy: I could climb. In ’84 I finished 2nd in the Coors Classic and was ready to fill the climber shoes when the Slurpee boys needed a scalatore for the Giro that year. RBA: Did you enter your winning Giro with a thought you could win? Andy: I was whistling “Johnny went a hunting and he did ride” the whole time. I finished fourth in the Tour of Romandie race the week before the Giro and every day on the bike I felt better than the previous. My thought was to win the race if it happened, but more importantly to use my fitness to have fun in the race on every day I felt good. Looking back, I might have been in the best form of my life. RBA: Okay, how miserable was it riding over the Gavia pass in the snow? Andy: I was cold and pissy and shivering too much to ride straight in the first hour of the stage, and that was on the flats. Then I got psyched. Misery loves company and I found myself at an International Pity Party and I didn’t want to go home early. With 14k to the summit of the Gavia the road narrowed to one lane, turned to dirt, and passed a 13-percent grade sign next to the 14k to the top marker. I attacked from the front and went at a pace that was 95-percent of my max, solo. Near the top it was snowing and we had 25k to descend. I led the descent as fast as I could safely go keeping one gear turning so the rest of my cogs wouldn’t ice up. The one time I looked down at my legs they had a layer of ice covering red skin. I never stopped pedaling. I finished 2nd that day and moved into the lead by stacks over most of my competitors. RBA: What were some of the most notable race bikes you rode? Andy: The Eddy Merckx made of Columbus 753 that he built for me post Tour ’91. I crashed it the first day out in a race in Britain and bent it. That bike had the mojo! Oh and my John Slawta built “Huffy” at the ’88 Giro. I bought it just before the race and it was like a horse finding the barn in the snowstorm on the Gavia. I love my old steel bikes! I can’t wait to get my Pegoretti built Gavia ’88 Hampsten bike next year. RBA: What would you rate as your second most memorable racing accomplishment? Andy: Hitting the first cobbles of the ’87 Paris Roubaix within sight of the front of the pack, and ahead of the curb to curb crash. Johnny earns his oats on Paris Roubaix day.